I'd been lemming this polish for sooooo long. Then just two weeks ago, there it was on ebay and the listing had two bottles. Including postage it still cost me less than if I had to purchase them in store here in Canberra (not that I would ever have found this discontinued lovely here). YAY. One happy camper. Glamour is a smooth and opal like peacock blue holographic polish. I have already described the finish of these polishes in my post about OPI Opening Night Gold, so I won't go into that again. This was three coats. Wear wasn't quite as good on this as it was on Opening Night Gold or Desire, but still better than China Glaze or Nfu Oh holos. 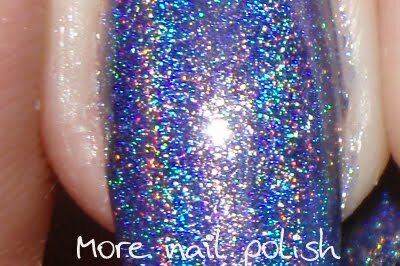 Again, a close up of the holo awesomeness on this glorious blue polish. Mmmmmwah - big kiss for you OPI Glamour. 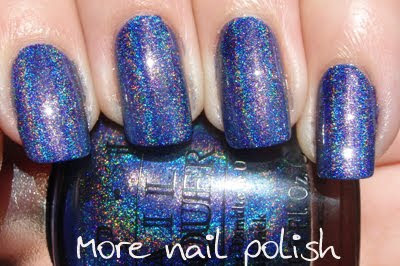 i'm not really one for holos, but this one looks pretty awesome!